Betty Denton, known as "The Ladycaner", learned chair caning by apprenticeship in the early 1990's from her mentor, friend and distant cousin, Ned Johnson. He had been caning for 75 years and was a master at his craft. After three years of apprentice work, Betty began caning on her own. She is proficient at hand (thru-the-hole) caning, primitive (over-the-round) caning, splint, rush, and press-in caning. She also repairs wicker. 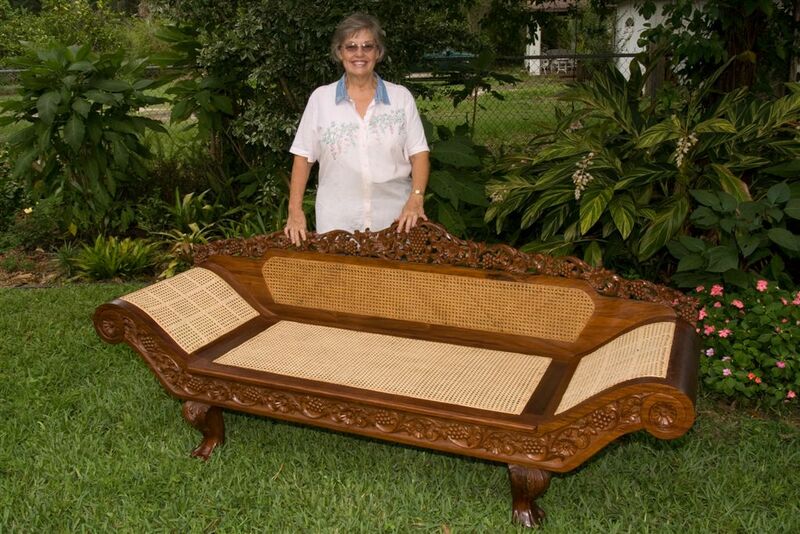 She teaches caning and rush, and repairs and restores antique furniture for her customers at her shop near Tampa, Florida, and has demonstrated her heritage craft at venues all over Florida and North Carolina. Within Florida, she is regularly seen at the Florida State Fair "Cracker Country" museum in Tampa and the Plant City Pioneer Day in Plant City. She has demonstrated at the Dade City Pioneer Museum, Florida Folk Festival in White Springs, Wauchula Pioneer Day, and the Highlands Hammock CCC Festival. She enjoys sharing her craft with others and is delighted to teach classes yearly at the Caladium Center in Lake Placid. She is full of funny stories and genuinely loves to share her passion for caning with others. Chair caning, and heritage seat weaving, specializing in hand caning, primitive (over-the-round) caning, splint, press-in, rush, and wicker repair and restoration. Antique furniture restoration available in addition to seat repair.